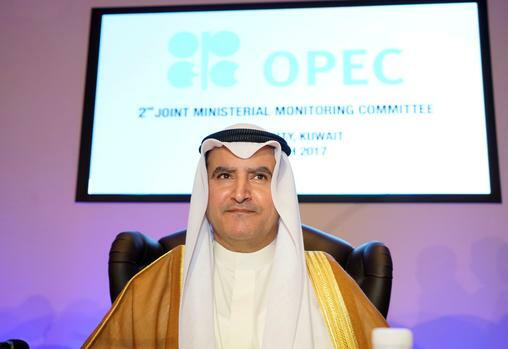 Minister Issam Almarzooq, Kuwait’s oil minister said OPEC and allied oil producers will keep reviewing options for their agreement to cut output, and a final decision on extending the deal beyond March could be postponed until the first quarter of 2018. The Organization of Petroleum Exporting Countries will consider all its alternatives if the market doesn’t re-balance by the end of March when the cuts expire, Kuwait’s Oil Minister Issam Almarzooq said Wednesday at a joint news conference with his Venezuelan counterpart in Kuwait City. OPEC may meet in March to consider prolonging the cuts it pledged to make, along with major suppliers including Russia, in an effort to stem a global glut, he said. “When we meet in November we will have five months to finish the deal, even then we may not be able to take a decision to extend the deal, so we might postpone the decision and hold an extraordinary meeting in March to decide,” Almarzooq said. Producers are still not close to agreeing on what to do when the accord expires, Venezuela’s Oil Minister Eulogio del Pino said at the conference. Global suppliers agreed in December to reduce output by about 1.8 million barrels a day in a drive to stabilize the market and prop up prices, and they extended their six-month accord through the first quarter. Ministers from Saudi Arabia, Venezuela, the United Arab Emirates and Russia have said producers may consider prolonging the cuts further. Benchmark Brent crude has slid 3.7 percent this year and is currently trading near $55 a barrel. Kuwait and Venezuela are both on the joint ministerial monitoring committee, known as JMMC, that reviews compliance with the agreed cuts. The committee will meet on Sept. 22 in Vienna, and both Almarzooq and Del Pino said there will be no serious discussions of an extension then. The drive to re-balance the market by pumping less crude is having some success, and it would be “appropriate” for producers to extend their cuts accord beyond March, Qatar’s minister of energy and industry, Mohammed Bin Saleh Al Sada, said Tuesday at a meeting with foreign diplomats in Doha. Nigeria, which is exempt from the accord due to the nation’s internal strife, has agreed to join the agreement if it reaches and sustains crude production at 1.8 million barrels day, Kuwait’s Almarzooq said.